The new academic year has started and as usual I am embedding technology in my teaching. This semester I am going to be more consciously using Twitter to post information to my current students rather than using Twitter to connect with my online colleagues. I am doing this because it is time to start applying what I have been discovering through my PhD research, which is that many OTs are using online technologies but many do not yet use technology well for information management and knowledge transfer activities. I have added a new hashtag to my frequently used list. It is the course code #OCC311 of the course that I am teaching this semester at the University of the Sunshine Coast. This course is titled Enabling Occupation: The adult. The focus is on understanding and critically anaylsing occupational therapy approaches. I would really appreciate input by the online OT community to demonstrate to students the power of social media in information management and knowledge transfer. I just posted on our blog about Twitter hashtags. Twitter is such a popular social media site but there are not many pediatric OT or PTs utilize it for keeping up with current information. I think it is key for people to understand that you can search Twitter even if you do not have a Twitter account. 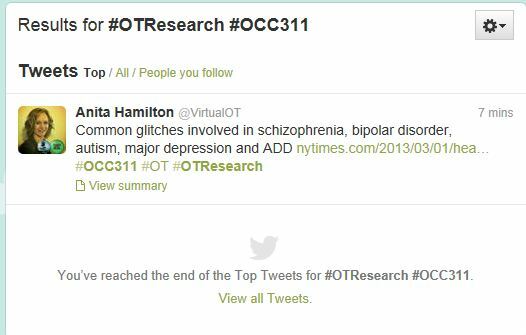 That way you can keep up on #OTresearch or #pediOT topics if you would like. Do you use any hashtags specific to pediatric OT? This seems like such a great idea, Anita – I like the idea of using a strategy to support student engagement in the material in a context that is on their terms. I am aware that Kate DeCleene from U of Indy also tried this with her students. I wonder how many other educators have used Twitter this way? I think I would like to try it myself next semester so I will be interested to hear how it goes for you! Hi Anita ! It is really a good idea. i can say that as i am a student.